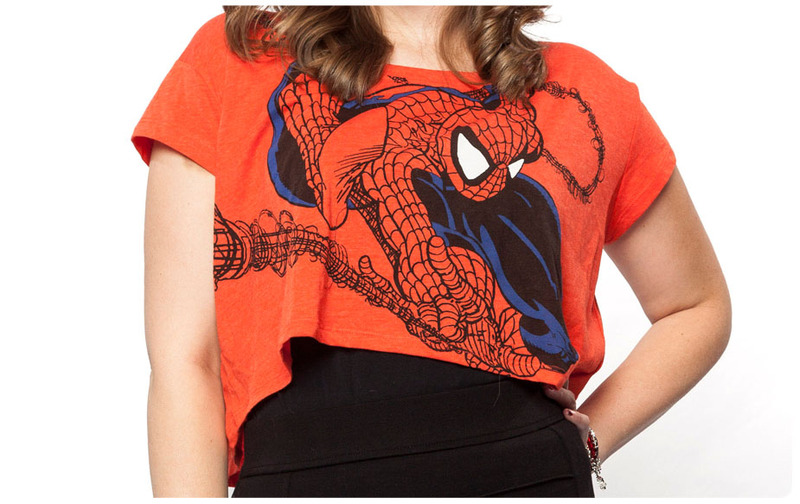 I snagged this Spiderman crop top from Forever21 over the summer. While they don’t have it anymore, Hot Topic has a couple of options. There’s this crop top or you can get a long sleeve version of my top here (which will be great for the upcoming seasons!). Since I wanted most of the attention to be focused on the cute top, I decided to layer it over a black tank that I had. Something like this from Old Navy would work great. Even though I wanted most of the attention to be on my top, I did want to have a little bit of texture in the skirt. I found this skirt at Forever21. Here’s a skirt very similar to the one I got. I also love this colorblocked skirt since it has some of that Spiderman blue in it. If you didn’t want to wear it with a tank and skirt, you could always throw it over a cute tank dress. I also wear the top and tank with a pair of black skinny jeans when I want to be a little more casual. I chose black wedges since they felt a bit more dressy for this outfit. I actually bought these as my original shoes for the Piranha Plant dress, but loved them so much after this shoot, I decided to keep them as is. The bracelet I picked up from 1928 Jewelry. I really like it because there are a lot of elements to it. Even though it’s Spiderman, it doesn’t compete too heavily with the shirt. Nail Polish is also a great way to add a little geek. 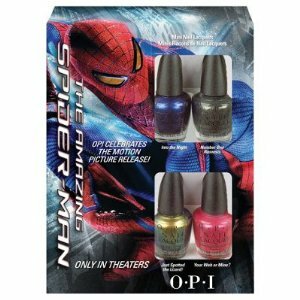 I wore Into the Night by OPI from their Spiderman collection. I opted to go for the mini collection so that I had a variety of colors to try. The Spiderman top is probably one of my favorite tops to wear. I love the fact that I can mix and match with it depending on various situations. As always, if you have put together a great geeky outfit, we’d love for you to share it with us either in the comments or on our Facebook page. Scruffy will be back later today with some of her favorite geek chic outfits she ran into at Celebration VI!